While other people avoided hurricane stormclouds left and right during the last Saturday in August, I celebrated my fiancee’s birthday by heading over to Patriot Place in Foxboro, MA, where my friends and I entered a curious building run by the interactive entertainment group 5 Wits. 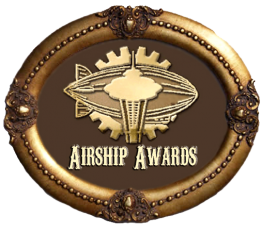 We bought tickets to what first appeared to be a steampunk art exhibition sponsored bySteamPuffin and walked into a room containing dazzling artwork, including a rotating gearwork table and neo-Victorian mixed media pieces. The only other person there introduced himself as Ryan, the intern at 5 Wits, who was busy with a feather duster cleaning the displays. Nothing much is going on, he explained, except for the unfortunate water damage that happened in the building (with the pre-Hurricane Irene rains pouring outside, it set up an appropriate backdrop). Suddenly, the lights dimmed, the sound of grinding gears were heard, and one of the paintings slid open to reveal a hidden door to a rusted metal room…. Read the rest over on Tor.com!